To make sure that customers can make bookings with your business, you will need to set up some bookable staff that can perform your services. 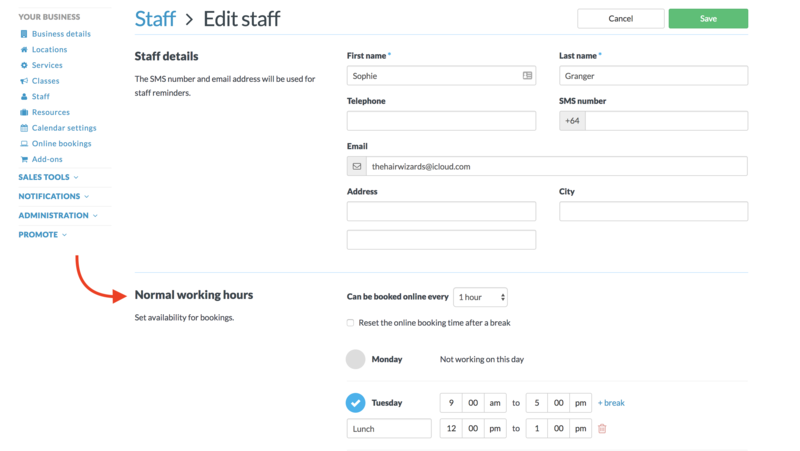 You can assign staff their own working hours, as well as individual services. Each staff member can be given their own unique login via their email address, so they can manage their own calendar and bookings. Add a new staff member to your account. Select their booking options and services. Complete the staff member's personal info. Set up the staff member's availability. 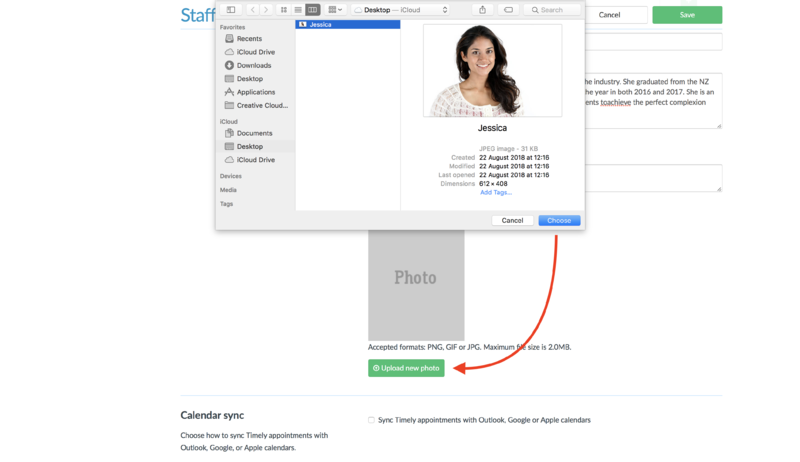 Give a staff member access to their calendar. The price of your plan is based directly on the number of active staff you have under Setup > Staff. When adding a new staff member to the account, you will be notified of the additional monthly fee. On your next billing date, the staff member will then be included in your regular monthly bill, along with your existing staff. Head to Setup > Staff in your Timely account. You can click Save here to create their profile, or continue on to add more information. To make this staff member available online, check the box next to Customers can schedule this staff member online. Check the box next to Send an automatic email each day with a copy of staff's appointments attached Find out more. Check the box to Show the staff member on your mini website. 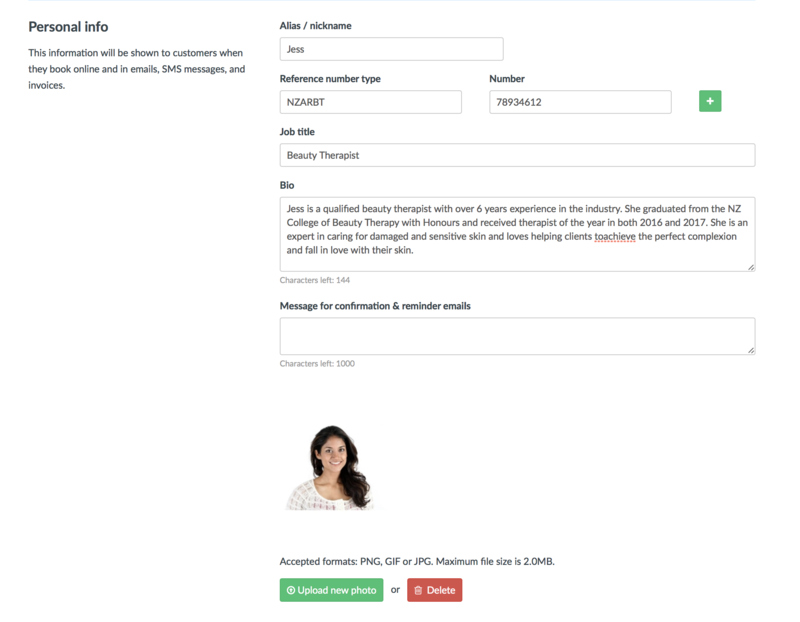 Extra information can be added to your staff to flesh out their profiles. This information is optional but is still important as it appears on the About us page of the mini-website. Add an Alias or nickname which can be used on the calendar. If they have a Provider or registration number, you can enter the Registration type and Registration number in the fields provided. Add a Job title (e.g. Beauty Therapist, Massage Therapist, Senior Stylist etc). 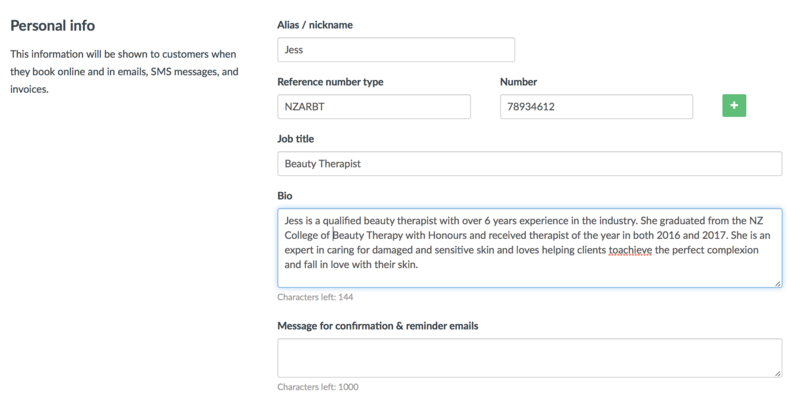 Then add a staff specific Message to include at the bottom of confirmation and reminder emails. This is added as a block of text at the end of the email. Finally, add a photo by clicking the Upload new photo button. Once you have saved and created the staff member's profile, you will be prompted to add their " Normal working hours". The hours that you set here will automatically be applied to that staff member in the Roster. You can then use the Roster to update any individual days where the staff member's working hours are different. Select how often you'd like staff to be booked using the Can be booked every setting (Find out more). Check out our How to set staff hours at a location guide for more information. Note: Staff access can only be granted by the account holder. Adjust their access as desired: Check out our How to set access permissions for staff guide for more information. Click Save to apply your changes and send a login email.